There are nearly as many things to do in the Bahamas as there are islands in the Bahamas, and with slightly more than 2,000 islands, inlets, cays, and coves covering this former British colonial outpost, that translates into enough Bahamas vacation ideas to keep even the most expansive of itineraries packed with fun things to do for the entire family. Whether you fancy hobnobbing with dolphins or going for the distance on a tropical golf course seemingly made in heaven, and all activities in between, you need to book passage on the next flight out to the Commonwealth of the Bahamas to experience excitement and adventure at its best. 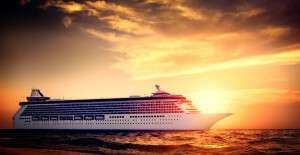 Sunset Cruise—set out past the channel buoys and tool around the islands aboard a motorized, luxury catamaran that sets out to catch the islands at their very best, as the sun set over the lush tropical foliage, and discover why the Bahamas are considered some of the best sailing grounds on the planet. Sample Bahamian delicacies like lemon pepper chicken or barbequed ribs while washing it all down with tasty complimentary beverages. A myriad of sailing packages are available from trained crews that know the islands, and understand how to please their guests with a cruise they will never forget. Horseback riding—if you ever wanted to be one of those people riding a horse across a deserted beach against the backdrop of pounding surf, you won’t find a better opportunity than when you visit the Bahamas. Owing to the constricted size of some of the chain’s islands, you best options for horse-riding activity will be found on Nassau/Paradise Island, Grand Bahamas Island, and on the Abacos. Indeed, equine lovers will want to be sure to slate time for a visit to the Abaco Barb, a critically endangered strain of the Spanish Barb horse breed, to discover their latest efforts to bring these noble animals from the brink of extinction. e any golfing experience you have ever experienced. Near constant sunshine, lush tropical courses, balmy breezes, and perfect golfing condition year round, Nassau averages seven hours of sun, and an annual winter temperature of 70°, so no time is a bad time to shoot a few rounds of golf in the idyllic surroundings of the Bahamas. Paddle with Pigs—in all likelihood, you had no idea that swimming with swine was an option regardless of the setting, but a magical cove tucked along the coast of Great Exuma, just north of the Tropic of Cancer, presents just that opportunity. Here, wild pigs might observe you cavorting in the waves for a bit before ambling out from behind their stunted island bushes to join you for a swim in the ocean. Friendly, feral, and floatable, these guys will have you laughing with delight as you play in the surf with them. Bahamas is getting familiar from a perch two hundred feet above the boat. From the beaches of Maui to the coastline of Mexico, parasailing is an exciting way to spend an afternoon for untold thousands of tourists. 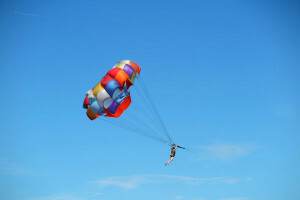 Get a look at all there is to see in the Bahamas from the best vantage point in the house poised 200-feet in the air. Explore Colonial History—while the islands are renowned for their natural beauty and warm people, the Commonwealth of the Bahamas offers a rich cultural and historical tapestry that is well worth a visit in its own right. History lovers will thrill at offshore excursions to the Berry Islands, and such storied destinations as Big Whale Cay to visit the first Anglican Church built in the area, or the impressive lighthouses that have guided mariners safely past Great Stirrup Cay since 1863. Don’t miss Crooked Island’s well-preserved historical properties known as Hope Greta House and Marine Farm. These two Loyalist compounds boasts an artillery battery and plantation house equipped with a period kitchen that provides a glimpse into the island’s rich colonial past. Deep Sea Fishing—the waters around the Bahamas are like a veritable supermarket for the local population, and the angler in your party will not want to miss out an afternoon, full day, or weekend deep sea fishing adventures. Get guided to the holes that are a favorite of local fishermen, and harvest the epic bounty that the surrounding seas provide on a daily basis. 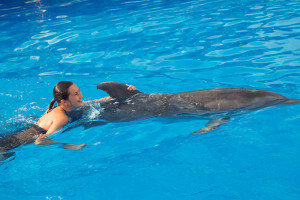 Swim with Dolphins—(and Sharks!) 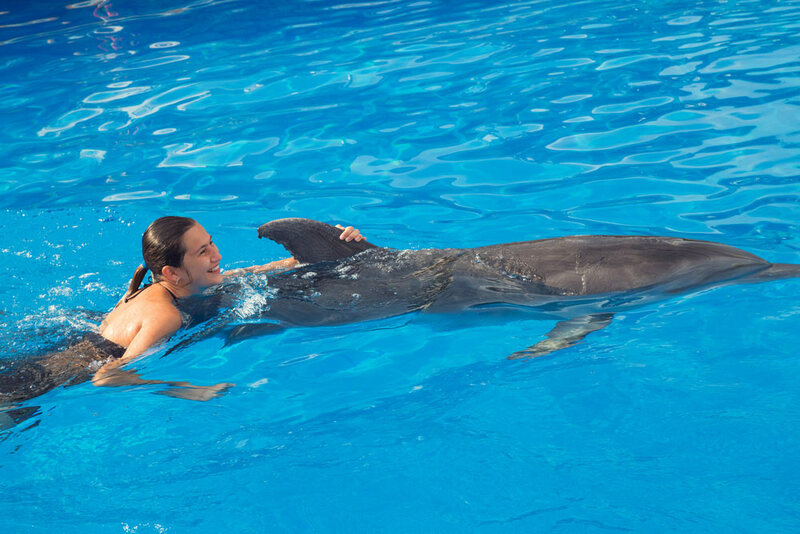 A one-of-a-kind adventure awaits visitors to Dolphin Cay who come to play, swim, and frolic with the local dolphin denizens. This unique resort experience is situated on 14-acres comprising upwards of seven million gallons of seawater is the largest marine habitats in the world dedicated to animal rescue and rehabilitation organizations. Learn about and interact with these amazingly intelligent creatures. Snorkeling and Diving—with some of the very best diving opportunities throughout the Caribbean, the Bahamas are a great place to slip on your flippers and do some underwater exploring. Be sure to visit Eleuthera Island’s blue holes with such famous names in the area as Boiling Hole, Ocean Hole, and the Queen’s Bath known for its stellar hot tubs. Aquaventure Water Park—is the ideal setting for family fun. This one-of-a-kind 141-acre water park offers non-stop thrills from the minute you enter to the second you leave. High speed water slides, roiling rapids, and wave surges are just some of the aquatic excitement that is waiting for you at this Atlantis Paradise Island water park. When planning your Bahamas Vacation, why not get a personalized charter quote to fly to the Bahamas by filling out the form in the right column.